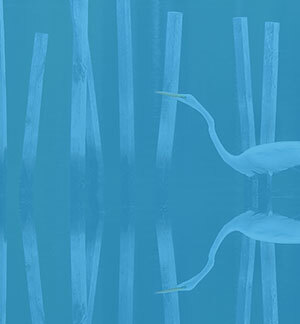 A blue crab scuttles along a pier in Mayo, Maryland. Probably the best-known creature in the Bay watershed is the famous blue crab, but many other species call this watershed home. The Chesapeake Bay provides food, water, cover, and nesting or nursery areas to more than 3,000 migratory and resident wildlife species. 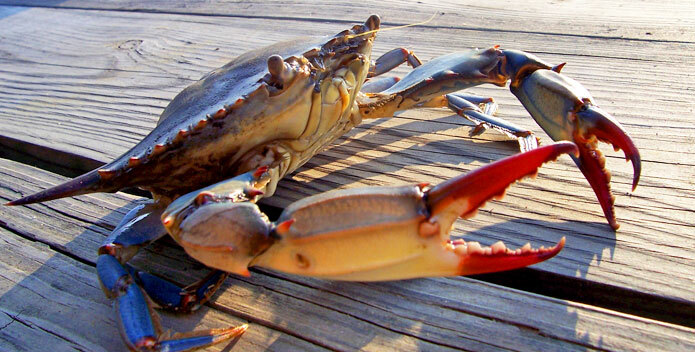 Crabs and oysters are famous Bay residents, but sadly their numbers are alarmingly low. From the 1950s to the 1970s, the average annual oyster catch was about 25 million pounds per year, and the blue crab harvest contributed nearly a third of the nation’s catch. Today, the Bay’s oyster population is a mere two percent of its historic level, and reduced amounts of underwater grass habitat, in addition to low summer levels of dissolved oxygen, continue to keep the crab population well-below the average. The blue crab requires a variety of aquatic habitats, from the mouth of the Bay to fresher rivers and creeks, in order to complete its life cycle. Adult crabs feed mostly on thin-skinned bivalves, fish, and plants, while it’s quite common for juvenile crabs to practice cannibalism when food is scarce. Female crabs can lay up to eight million eggs in one season, and their meat is considered “sweeter” than males. The oyster is a keystone species, meaning it is exceptionally important to the Chesapeake’s ecosystem, and the decimation of oysters has contributed to the precarious state of the Bay’s overall health. Like filters in a giant fish tank, oysters purify the Bay as they strain algae from the water for their food. 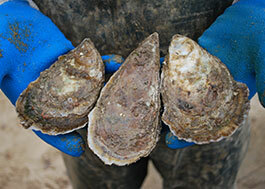 Oyster reefs also provide habitat and food for scores of marine plants and animals. Waterfowl and other birds migrating along the Atlantic Flyway stop here, finding food and shelter in coves and marshes. The migration of the common loon and tundra swan are very much signs of the winter season along the Chesapeake. The Chesapeake is the winter home for tundra swans, Canada geese, and a variety of ducks including canvasbacks, pintails, scoters, eiders, and ruddy ducks. 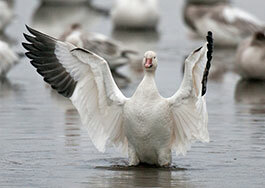 On average, nearly one million waterfowl winter each year on the Bay. It is also a major nesting area for the threatened bald eagle, the once-endangered brown pelican, double-crested cormorants, and home to the world's largest population of another raptor, the osprey, with more than 2,000 nesting pairs. Just as the loon is a harbinger of winter, the osprey is the Chesapeake's harbinger of spring. Photo Credit: Michael Eversmier, M.A.R.I. 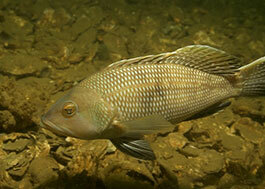 The Chesapeake's tidal freshwater tributaries provide spawning and nursery sites for several important species of fish, such as white and yellow perch, striped bass (also known as ‘rockfish’), herring, American shad, and hickory shad. Other species include alewife, shortnose and Atlantic sturgeon. During the warmer months, numerous marine species, including bluefish, weakfish, croaker, Atlantic menhaden, flounder, and spot, and larger cartilaginous fishes such as sandbar sharks and cownose rays, enter the Bay to feed on its rich food supply. And, of course, there are many estuarine fish that make the Chesapeake Bay their home year-round, including the Bay anchovy, silver perch, and lined seahorse. Larger creatures that thrive in the Bay include bottlenose dolphins, which are plentiful in deeper waters but can also be found near harbors. 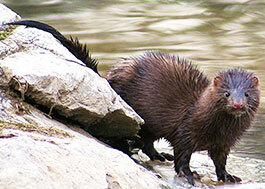 Water mammals share the watershed with their on-land neighbors such as river otters, the white-tailed and sika deer, bobcats, marsh rabbits, muskrat, and red fox. Turtles and snakes are the most common reptiles in the Bay watershed. Species include the diamondback terrapin, loggerhead turtles, and more than 40 types of snakes. 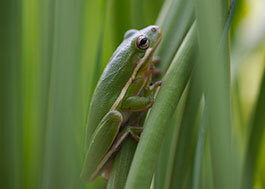 The watershed also is home to numerous varieties of frogs, including the northern green frog, toads, salamanders, and newts.